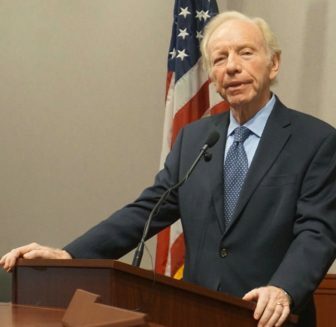 He hasn’t won the seat yet, but GOP gubernatorial candidate Bob Stefanowski is already tapping people to serve on a transition team, including former Connecticut Sen. Joseph Lieberman. Stefanowski campaign spokesman Kendall Marr said Lieberman has agreed to serve in a general “advisory role,” instead of leading any specific transition team. “Anything and everything will be on the table,” Marr said about Lieberman’s help. Rejected by Connecticut Democrats in 2006, when the party chose Ned Lamont as its Senate candidate, Lieberman was re-elected as an independent. Now Lamont is Stefanowski’s Democratic rival in the governor’s race that will be decided in next Tuesday’s election. Meanwhile, Lieberman retired from the Senate in 2013 and is now a lobbyist with the New York-based law firm Kasowitz Benson Torres. One of the principals, Marc Kasowitz, is President Donald Trump’s personal lawyer. “If there’s a conflict of interest, we would get advice from other sources,” Marr added. Lieberman did not return requests for comment. Marr said there are other individuals, both inside and outside Connecticut, advising the campaign who may serve on the Stefanowski transition team. “There’s a wide variety of people who he’s getting advice form,” Marr said.